This topic relates more the External Movements (emoveemnts) than to Events, but there is no Ext Movements forum. The design of EMu's External Movements module is such that a movement is either inward or outward. There is a shared purpose field, Source/Destination, which only has meaning when considered alongside the value in the Movement Direction field. So how then can we track movements between venues for travelling exhibitions? Presently our TravEx team use EMu only to a very minimal extent, and I feel we might be abelt o make their workflows far more efficient if this shortcoming in EMu is addressed. Basically, I think we need separate fields for source and destination, and the Movement Direction needs to have three values: "inward", "outward", and "between venues". This would help us immensely. Has anyone else come across this problem? And how have you resolved it? UPMAA has customized the Movements module to do exactly what you have described, external point to point movements, at the request of our traveling exhibits staff. We added a third radio button to the movement direction field group and called it "External". We also separated the combined "Source/Destination" field groups into two sets and removed some of the contact information to make room. I can provide a screen shot of our configuration if you would like. Museum Victoria has customised the Events module and created a new module called the Exhibition Objects module to better handle object-specific information for exhibitions and displays. Over the last year or so we have discussed using the Movements module (at present it has no entries) to better track touring exhibitions and would be happy to be involved in future discussions. The third radio button is a good idea and matches the values we have in the Event Type field in the Events module for example Incoming Travelling Exhibition and Outgoing Travelling Exhibition. Separation of Source and Destination is also wise and less confusing. For us the stumbling block is planning to send/receive material and not having the right field to record a ‘future’ movement – we would like to say that in 3 months time a group of objects will be in crates heading to New Zealand – but before then they will be in one of our collection stores – they cannot be in two places at once! If we could record this type of information we could send more accurate packing lists to borrowers etc direct from EMu. Any ideas? We look forward to hearing how you handle or would like to handle this type of information. I have already asked KE (several months ago) for further information on the Exhibit Items module, as I know the NMA and MV use it (and Te Papa?). Alas, so far I have not been given anything. Scott - screenshot of movements would be great. Could you attach here for beneift of others? I'm wondering if this might be a worthwhile change to the base version of EMu, rather than lots of us requesting this change separately, and thus incurring costs separately. Our Movement module has rarely been used. It really only contains data from legacy systems, but since we have streamlined the loans process in EMu for research loans, there is little need to use the movement Module other than for Exhibition Loans. To be honest, we are still finding our feet with regards to documenting Exhibition Loans. Having said that I can think of at least one active touring exhibition loan and I can see the issue of documenting its movement BETWEEN venues. The notion of having a third radio button is a good one, as is separating source/destination attachments. I think the limitations of the Movement Module may become more of an issue as more touring exhibits are encountered and our exhibition management team become more familiar with EMu. So if you don't mind, the NHM, London would like to be an "active listener" on your discussions. 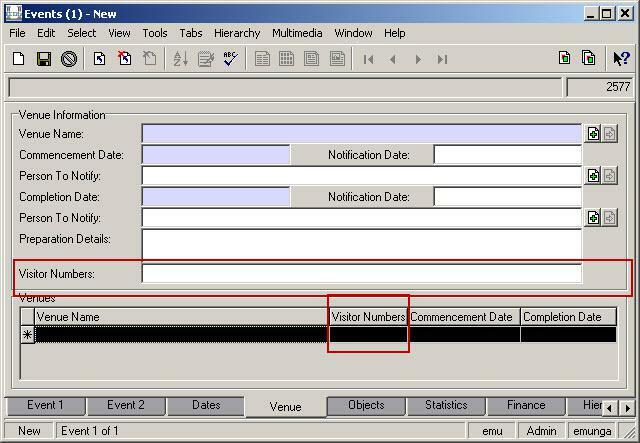 Nancy, I'm intrigued by your customisations of the Events Module and the development of the Exhibition Objects Module. Have these appeared in presentations at the Users meetings that we can view? Alternatively would it be too much trouble to post some screenshots? It's always enlightening to see how others have tackled particular problems! I don't think I'm talking out of turn if I say that the workflow we have built into our Loans Module allows us to record the list of intended specimens for loan without changing the status of the loan to 'dispatched'. Thus we can compile object lists, condition statements and handling details (attached to the loan) and "in theory" - since these have not yet all been developed - email these off as pdf reports from EMu in advance of the loan actually being dispatched. Once we know the movement details (courier, dates etc), THEN we can complete the Movement record and associate with the loan and thus change it's status to 'dispatched'. Once again, this thread goes to show the diversity of EMu functionality resulting from institution implementations done in isolation. From discussions at the NA EMu User meeting it sounds like the NMNH Smithsonian Institute have a completely different approach (bundle all loans, movements, accessions, deaccessions into a single 'Transactions' module). I really hope that the proposal that was muted this year - to share these novel solutions to collections management problems by having interactive 'poster sessions' in future User Meetings - comes to fruition. Apologies for not getting back to this post earlier. I've provided the two tabs UPMAA customized in the movements module to provide for point to point external movements. We just submitted our client configurations to KE last week so the slides I've attached are our designs only and not what our final product will look like. Once we receive our client I'd be happy to provide screenshots of these tabs. I'd like to echo Dave's comments about the diversity of policy implementation among EMu users. As we move forward with our migration process we are refining our policies and procedures to more closely mesh with EMu and I'm very interested in seeing how other EMu users are solving some of these common issues. Hi folks - long time no speak. Our NGA Travelling Exhibitions team have reached out to me for help this week. Basically, they are hoping to replace their current reporting excel spreadsheet solution with an EMu based solution. 1. Object Lists change from venue to venue. Does this mean we should be creating a separate Loan record and a separate Event record for each venue? 2. The visitor stats on Venue tab in Events does not allow for month-by-month reporting, unless you enter each calendar month as a separate row in the the Venues nested table, and that's a pretty confusing eay of looking at a venue list. 3. External Movements cannot track transfers between two external sites. 1 and 2 are prob best left to a different thread, but if anyone would care to share their solutions to these problems I would love to see what you've done. Nancy, I am very interested in your implementation of Exhibition Objects for this purpose. As far as point 3 goes, we need the "transfer" or "external" option. KE have disappointingly not not taken up this issue, despite it being raised by several clients. Scott, Nancy, anyone - would you be so kind as to share with me/us, either here or in email, screenshots of your External Movements modules and how they are used to capture transfers between external sites? I would like to refer to them in drafting our user spec. Sorry that I didn't see this earlier post before replying to your new post specifically about external movement. During our customization periods this limitation was a sticking point with our Traveling Exhibits and Loans staff. Sorry that my earlier development slides were a bit ugly but we had not yet received out client from KE. Now that we have it, I've posted images (both query and display) of how we have chosen to handle external movements in your other post. Had trouble posting images last time, let's try again. 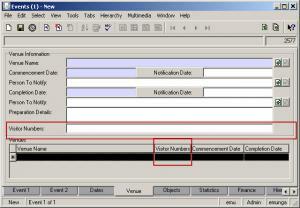 Our Venues tab in Events has been customised to include Vistor Numbers. This would not be needed if there were a separate sub-event record for each venue, as we could just use the stats tab. Does anyone else do this visitor stats stuff? If so, how have you tackled this?